Here’s a quick question I received from a reader of my 2008 baseball-themed novel, Six Innings (now in paperback — cheap!) In this case, I’ve included his last name (only) since it explains his curiosity. hello mr. preller. i gotta ask ya who is frank ausanio? maybe someday ya can let me know. its strange to see that last name. now i’m curious… thanks and have a great day. There’s a story behind that name, and now you’ve given me a reason to tell it. About five or six years ago, I was playing in a men’s hardball game in Kingston, NY. We had traveled over an hour to get to the game, coming from our jobs as carpenters and accountants, lawyers, troopers, and children’s book authors. We played under the lights. At that time we were part of the Capital District Senior Men’s Baseball League, in the age 38-and-over division. My team was the Pirates and we were good; we were playing (“versing?”) the Hummingbirds, traditionally one of the strongest teams in the league. It was a close, well-played game, and we were down by one run in the final frame. The Hummingbirds brought out their new closer — he stood 6’1,” weighed two hundred well-muscled pounds, and threw really, really hard. Word was he could still touch 90 on a good day. From my spot on the on-deck circle, it looked (alas) like a good day. He grunted when he pitched, which was unsettling to say the least. 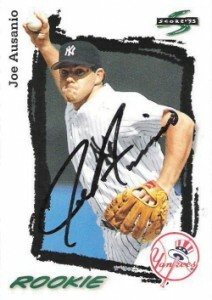 I had heard some talk about him before, this was Joe Ausanio, a former Major League pitcher who had played for the New York Yankees in parts of the 1994 and 1995 seasons. I later looked up Joe’s career statistics: He went 4-1 lifetime, appeared in 41 games, threw 53 innings, and struck out 51 hitters. Nearly a batter an inning, a very impressive statistic. However, Joe Ausanio surrendered 58 hits including far too many home runs (12), and walked 28 batters with a career ERA of 5.57. Not quite good enough to stick. In other words, Joe was very aggressive, challenging hitters for better and for worse. And he had control problems, too many walks. The difference between succeeding in the Major Leagues as opposed to “failure” — in quotes, please — is razor thin. 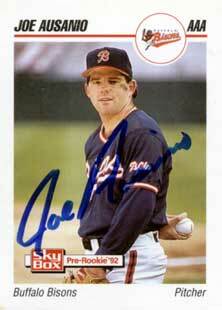 Joe later told me that he struck out five future Hall-of-Famers in his brief time in the Big Leagues. He would not bother to add my name to that illustrious list. It was an honor to step into the batter’s box to face him. And a little frightening. I was determined to compete. First pitch: fastball on the outside corner, a called strike. Wow, great location, I barely saw it. I stepped out of the box, gave myself a pep talk, stepped in again. Next pitch, same result. The bat never moved from my shoulder; the ball was on me too quick. Okay, the count was 0-2. No way was I going down looking. I choked up, reminded myself, fast to the ball, fast to the ball. Joe Ausanio wound up, dropped down, and threw a sidearm curveball. A laredo, as David Cone used to call it. It started at my head and fell off the table, landing in the lower outside zone of the plate. I swung blindly, wildly, and missed the ball by as much as a ball could be missed. And I mean that mathematically. It would have been impossible to miss it by more than I missed that pitch. I was outmatched and outclassed by a former New York Yankee. No contest. None. And I didn’t mind in the least. It was a privilege. After the game, the two teams hung out around the coolers, had a beer and some laughs, talked the game over. It turned out that Joe Ausanio was a great guy, likable, modest, born in Kingston. At the time, he worked in some capacity with the Tampa Bay Devil Rays (as they were called at the time), still hoping to catch on with a team. Joe still had his fastball, he said. Yes, I nodded, he still had his fastball. Needless to say, the Hummingbirds won the game. Joe struck out the next batter, but then something wonderful happened. My teammate and friend Ron Smaka drove a line drive into RF for a clean single. Ausanio was stunned; this kind of thing did not happen often. He struck out the next batter and the game was done. Ausanio fires from shallow center, the ball skips once on the grass to catcher Travis Green. “Hit it! Hit it! Slide!” a cacophony of voices cry. Scooter slides. Green catches the ball and sweeps the tag across Scooter’s cleats. “Out!” the home-plate umpire yells. In that instant, everything freezes, a DVD on pause, then explodes into action. Both teams, the fans, the coaches — shouting, cheering, hooting, protesting — every emotion galvanized at once, a kinetic charge of energy rising up through the five layers of the earth’s atmosphere, their cries and dreams climbing from troposphere to exosphere, soaring into the velvet void of deepest space. A roar that happens on Little League fields every day, in every town, city, state, and country all over the world, from Logansport to Osaka, San Cristobal to Little Rock. The sound the game makes when it is played passionately, with young hearts. My best, and thanks for asking. Are you related to him?